Finally Alan Moore's Watchmen (graphic novel) has its movie adaptation directed by the 300 famed Zack Snyder! The movie is scheduled for release March 2009 and honestly I'm dying to watch it! For those who are thinking what the fuss is all about - Watchmen is supposed to be the grandmother of all seriously kickass graphic novels out there written by Alan Moore (more of his works - In the Hell, Prometheus, League of Extraordinary Gentlemen etc). Alan Moore though didn't seem to be too happy towards the Watchmen movie adaptation and has apparently requested to be discredited. According to him Watchmen book / graphic novel is supposed to be read sitting by a fireplace while sipping hot choco. But hey, I think he hasn't seen Zack Snyder's 300 so far so he doesn't really know that Watchmen is in good hands! 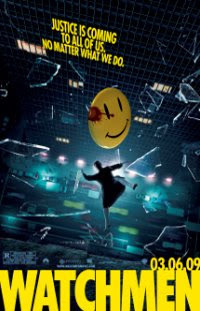 To really understand how good it is - take Darknight movie and multiply it by itself three times then add 3 of the best movies you ever watched to it, Watchmen graphic novel (by Alan Moore) is that good! Yeah, a bit of exaggeration there but trust me it IS the real stuff and if you are into some serious reading and you haven't read Watchmen then you better stop claiming being into any serious reading. So you can see how exciting it would be to watch a really well done movie based on such an Epic! Looking at the trailor I've a feeling that Zack Snyder did a good job and we won't be disappointed!